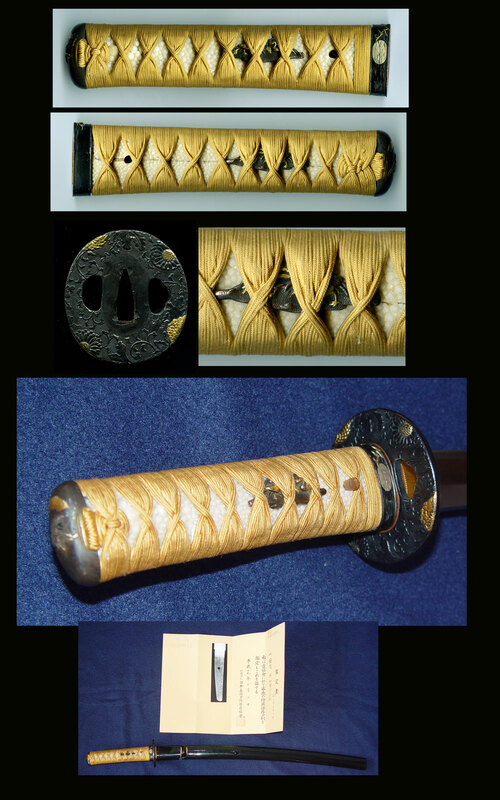 Wakizashi by Kaga no Kami Sadanori. Sadanori was a top maker from the famous Inouye Shinkai School. Because his teacher was so talented, his students often get forgotten as Shinkai was one of the top masters from the Osaka Shinto School. But his top tier students all were very good, and there are excellent examples of them that show high quality and skill. For example this blade is flawless as is expected from this mainline school. If you have read in books that really good blades have a steel that looks “wet”, here is the case in point. 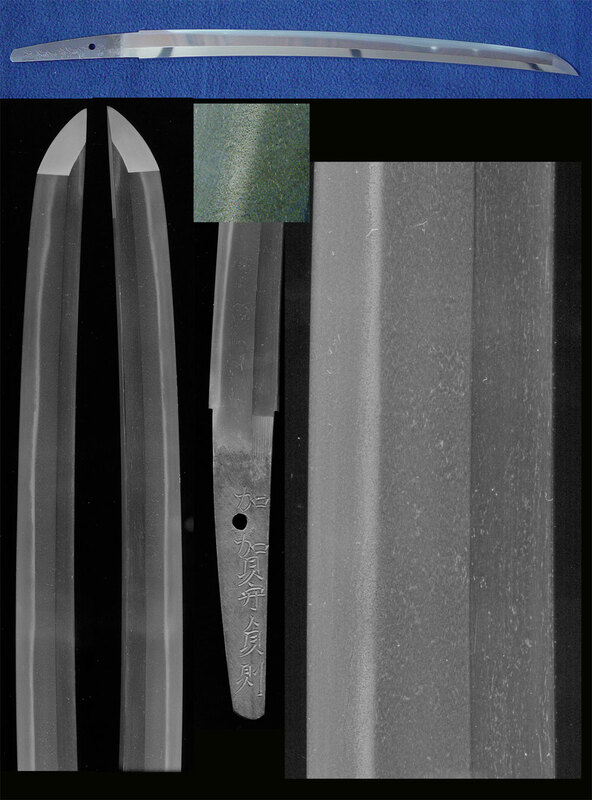 Osaka Shinto blades are nie deki with lots of ji nie which makes the ji appears as if it is wet due to the bright high quality ji nie that reflects the light. Done in the style that Shinkai is most famous for, this blade is done ina very well done suguha based nie deki hamon. Small kinsuji appears very finely and the ji nie is gorgeous. The itame hada is well knit and there are NO flaws. Boshi is very healthy with a nice turnback. The tang is ubu 1 hole and in mint condition. This blade is ideal for any collector to enjoy and it also comes with a very nice mount. The handle has been done in a very nice string wrap with the fuchi kashira of shakudo with a design of the crane flying in the moonlight. The menuki are also shakudo with a design of cranes in the water. This is interesting as the design is done on nanako which is unusual for menuki.. Scabbard is a nice black roiro lacquer, and in mint condition as well. The tsuba is a nice shakudo nanako older type with a design of chrysanthemums and leaves. There is a nice use of gold for the accents. NBTHK Hozon certified.